It was time for another run through the forest this week with a trip to Wendover Woods. Wendover is a smallish market town near to the much larger town of Aylesbury in Buckinghamshire. 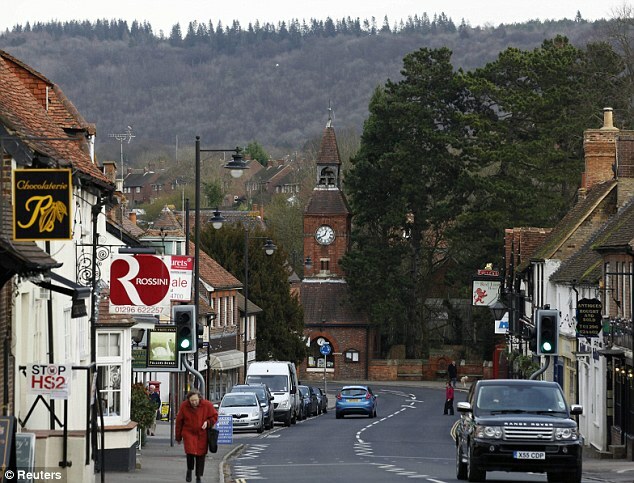 This area is sometimes known as the ‘Gateway to the Chilterns’, that range of wooded hills to the north west of London. Wendover has a long history dating back at least as far as Anglo-Saxon times. Its name apparently means ‘white water’ - a reference to the chalk stream that originates in the neighbouring hills and runs down through the town. After the Norman Conquest the Manor of ‘Wendovre’ fell into the possesion of the crown and of William the Conqueror. Wendover was granted a market charter in 1214 and had become a borough in its own right in 1228. Many of the buildings in the town centre date from the seventeenth century. It seems there was a burst of rebuilding following or possibly because of the English Civil War. In 1721 the Wendover Turnpike Trust was established and the town became an important coaching stop on the route heading northwest out of London. In the late eighteenth century a branch of the Grand Union Canal arrived here. It was fed by the local streams and allowed local industries to transport their goods. In 1892 the railway arrived and Wendover truly became a commuter town. Wendover has a long association with the RAF. In 1913 Alfred de Rothschild gave land to form a base for the Royal Flying Corps. That area is nowadays the RAF base at Halton Camp. It is not an air base as such as it only has a grass strip used by light aircraft and gliders. Rather it is a base for training, maintenance and logistics. And the bad news is ... the base is due to close in 2022. What will become of the land I don’t know (more houses for commuters I expect). Modern day Wendover is an attractive, prosperous place with many old buildings. Here’s a view of the High Street with the wooded hills looming in the distance. Wendover Woods are situated on a hillside just outside the town. They comprise around 800 acres of coniferous and broadleaf woodland and contain within them the highest point of the Chilterns at Haddington Hill. The woods are criss crossed by many miles of trails and paths. The land is owned by Forestry England who have made efforts to turn the place into a nature reserve and recreational area. There is a car-park, a café, a playground, a Go Ape adventure course and a Gruffalo! It would be a pleasant spot to bring the family on a Saturday morning - it reminded me very much of Alice Holt Forest. The woods are popular with walkers, runners and mountain bikers and host a wide variety of running and cycling events. There is also a 50 mile race for all you ultra fans! The latest addition to the events calendar is a parkrun which began back in September. This would be just the tenth running. Wendover Woods is slightly unusual in that it is a single lap course - you don’t find too many one lappers. It takes place mainly on dirt and gravel paths. It is one of the tougher courses I have run in that it is mainly downhill in the first half and uphill in the second. The results show that it a relatively slow course - nobody yet has run faster than eighteen minutes. The weather today was a bit grey and damp. I was worried it was going to be worse than that as I had driven through several downpours on my way there but it was okay ... just a little damp. In its early stages this parkrun has been averaging around a hundred starters and there were 89 runners there today. They seemed to shoot off quite quickly as we ran back past the visitor centre. As we started the long descent the faster runners started to stretch away from me. I’m not so good at downhill running these days - my old joints don’t take the pounding so well. I must have been the only participant who was looking forward to halfway so that I could start running uphill. I was about eighth at the halfway point and did manage to pass a couple of runners in the second half. It was a hard slog though trudging up from the lower slopes of the forest up to nearly the highest point. I got there in the end - sixth place in 21:04. I was perfectly happy with that - it was faster than I had been expecting on such a tough course. I was glad to have visited Wendover Woods. It’s a lovely setting for a parkrun and it offers good facilities including a café for after the run. I’m kinda glad though that I’ve ticked that course off my list and don’t have to do it again. My statistics for today - that brought my total of parkrun venues up to 185 (and to 210 parkruns all together). I was first in my age group, first overall on age graded scores and I set a new age category course best. I shall finish as usual with a YouTube video of the course. Here’s one from just a couple of weeks ago.